The hearty applause started the moment after the first-act blackout. 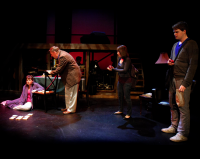 When the lights came up for intermission, however, a quick silence pervaded the Next To Normal audience at the 4th Wall Theatre in Bloomfield, New Jersey. It’s the type of reaction that I saw the Pulitzer Prize-winner get once off-Broadway and twice on Broadway. Attendees wanted to reward the achievements of Brian Yorkey’s book and lyrics and Tom Kitt’s music, not to mention the cast, which was in top form here, too. But then they realized that applause and enthusiasm might suggest that they weren’t taking the somber story seriously enough. Hence came the quick and resulting quiet. From the first scene, the audience had come to care for the Goodmans: mother Diana, father Dan, son Gabe and daughter Natalie. Most everyone in attendance could relate to them all trying to get through “Just Another Day” – as we all do. A typical American family? Not quite. Average mothers don’t put slices of white bread directly on the floor en route to making sandwiches. They also don’t bring out birthday cakes embossed with many candles in order to celebrate the 18th birthday of a son who died in infancy. Although Diana saw Dan and Natalie reacting in horror, she stayed adamant that Gabe was alive and well and living with them. Seven songs pass before an audience realizes that the Gabe they’ve been seeing is not a real person, but the full-blown figment of Diana’s imagination. And while every parent who has more than one child staunchly maintains that “I love you all the same,” the best Diana can say to Natalie is “I love you as much as I can.” That’s enough for the girl to succumb to her boyfriend Henry’s suggestion that she try marijuana. 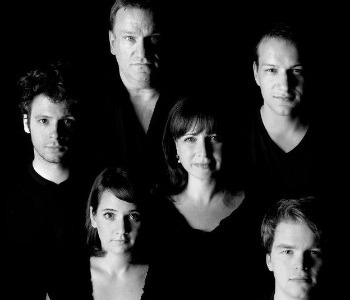 Is this family next to normal, far from it – or even normal? On and off-Broadway, crowds had gasped when they learned that Diana envisioned Gabe as alive. Here in Bloomfield, the intake of breath wasn’t nearly as loud. 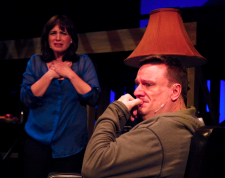 I’m betting that those who stayed silent were Next To Normal veterans who’d known the show from one or more of its hundreds of New York performances – and who wanted to see it again (and again). As the lights came up, the people to my right and those behind me started animatedly chatting with each other. They turned out to be members of a theater party who were new to the show. And what brought them there? “We work in the mental health field,” explained one woman. Ah! Now I’d have a chance to find out just how accurate Next to Normal was. I’d always been bothered by the scene between Diana and a doctor who was portrayed as uncaring. Nothing against actor John Wilkening; he did his job well. But in rattling off in lickety-split fashion the medications that Diana should take implied that those in the medical profession don’t care all that much about their patients. The doctor then exacerbated the situation by accelerating his litany as he went on – not unlike the way some people speed up when they leave their phone numbers on your answering machine. It has to be. Diana and Dan are either a bit below or above 40, so they would sing music of their generation: rock. So would their children and Henry. Kitt’s music serves the piece very well. While many in the house did indeed gasp, I heard no surprise from the mental health workers. I did turn to get a quick look at those on my right. Their lips were pursed and they were nodding slowly. 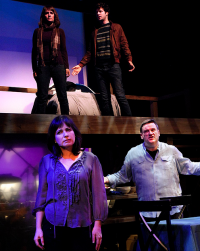 Once again, Next To Normal apparently got it right. “Not every husband is as supportive as Dan is, though,” said one worker after the show had ended. Indeed, many wives in the audience must have wished that their husbands could love them as much as Dan loved Diana. He was truly devoted to her, no matter how much and how often she had disappointed him. If patience could be measured in numbers, Dan would have had more of it than a century’s worth of productions of Gilbert and Sullivan’s Patience. Here in Bloomfield, Gregory G. Allen beautifully conveyed that commitment. life can deliver. 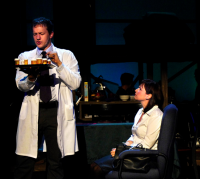 If you make Next To Normal your next production, you’ll be making great acting demands of your actress. Anguish, craziness and the calm before the storm are only three necessary ingredients to this complex character. And yet here in Bloomfield, Nancy Feldman made it look easy. Although her vocal cords had to be taxed -- Diana sings in 14 of the 37 songs -- Feldman seemed to breeze through the demanding charts. Granted, director Kate Swan took her lead from original director Michael Greif in the way she handled Gabe. David Maglione slithered around the stage like a Garden of Eden serpent – as had Aaron Tveit in the off-Broadway and Broadway productions. Both were ominous and menacing. Must this be? Yes, one can effectively argue that Gabe is, in a manner of speaking, a demon and an obsession to Diana. But there’s another possibility that a director just may want to investigate. Wouldn’t a mother who’s lost a son in infancy -- and thinks about what he might be today -- envision him as a stalwart and nice young man? True, teens are famous for rebelling, and “I’m Alive” does sound as if it’s an anthem of defiance. But Diana still might imagine her young man appealing and filled with joy. When you do your Next To Normal, try a different approach – at least in rehearsals – and see if a kinder, gentler Gabe works for you. There’s a flashback that shows us when Diana and Dan were dating. To youthen Dan, the costume designer put Gregory G. Allen in an ordinary-looking sweater that didn’t automatically suggest a young man. You might instead consider a distinctively collegiate sweater – one with a school’s name or at least some letters – to establish that Dan is in his late teens or early twenties. Putting a baseball cap on his head would help, too. Natalie must go from being badly influenced by Henry to becoming a bad influence on him. Kelly Karcher maneuvered this well, and Miles G. Jackson was equally proficient in showing the lad’s ever-growing distress. For all the talk that teenagers fiercely want to be independent, some kids, like Natalie, would welcome a fully functioning mother. Karcher was touching in the way that she expressed that longing. And considering that she and Feldman had the same hairdo, was Swan suggesting that Natalie was trying to bond with her mother in any way possible? Did Natalie feel that by resembling her mother that Diana might love her more? If these were Swan’s intentions, so much the better; if not, they’re ideas for you to consider in your production. On Broadway, the set was so full of light bulbs to warrant the charge “Overproduced!” Here, Jasmine Vogue Pai used a two-level set, too, but its bare-bones simplicity better accommodated the story. If you’ve recently overtaxed your choreographers, you can rest them with Next To Normal; aside from a waltz between mother and son, there’s little terpsichore. Save your brass section for another show, too; this one is string-heavy – a cello, violin, bass and guitar are the most prominent instruments – and here Markus Hauck’s band was finger-pickin’ good. By the way, none of the mental health workers I spoke to wanted to be identified. When I asked them to repeat the name of the facility where they worked, they were even too gun-shy to reveal that. Well, as Next To Normal shows, we all have our issues. You may e-mail Peter at pfilichia@aol.com. 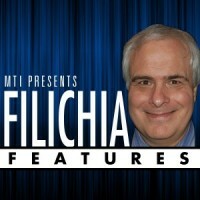 Check out his weekly column each Tuesday at www.masterworksbroadway.com and each Friday at www.kritzerland.com. His newest book, Broadway Musical MVPs, 1960-2010: The Most Valuable Players of the Past 50 Seasons, is now available through Applause Books and at www.amazon.com.